With protests and even rioting spreading across the world, the economic problems we are currently facing have become obvious to all. No longer can words such as recovery be used to describe our present state of affairs. Many aspects of this economic crisis can be written about, but at G.I. Metals DMCC, we project that no variable of the global economic meltdown is more worthy of being addressed than the issue of currency crisis. Once the nature of how credit and debt work in a fiat based system is understood, the origin of our present crises suddenly makes a lot more sense. This fiat based system can only be kept afloat through money printing and the use of recurrent deficit financing. Even if the awaiting fiat currency crisis has not yet become the most pressing issue at hand, we forecast that the present crisis' end-game will be a collapse of the U.S. dollar. This would have a cascading effect upon other nations' currencies whose treasuries mostly back their own currencies with Euros, dollars and American bonds. With this in mind, we believe that investors should not be focusing their attention on any aspect of today's crises - important as they might be - over and above the end game of our current predicament: the collapse of unbacked fiat currencies that have already started to breathe their last breaths. Since the Federal Reserve has taken charge of issuing American money in 1918, the US dollar has lost approximately 97% of its value. This means that only about 3% of the dollar's original value is left. Similar losses in purchasing power can be witnessed in other currencies around the world. In fact, the present currency wars we are witnessing are not a competition to strengthen legal tender. They are instead a race to the bottom, with each nation purposely devaluing their currencies in order to compete with each other in exporting their goods and products, and as well, pay off their debts by stealth. Currently, the Federal Reserve is compelled to print money at an exceedingly high rate in order to buy their own debt which is no longer being purchased as it was before by other nations such as China, and to artificially keep interest rates down. Were these rates to rise due to investor abandonment of American bonds, the US government would have to default on their debt as they would have to pay unsustainable amounts of interest to their creditors. If interest rates on the national debt rose to 10% as a result of investors abandoning these bonds, the US government would have to pay more money in interest than they receive in tax receipts per year; that is how great the amount of American debt is relative to gross domestic product (GDP). Hence, the Federal Reserve must keep printing money and purchasing their own bonds so that interest rates remain near zero. Evidently, this situation is unsustainable. A devalued dollar allows the U.S. to pay their debt off much more easily with cheap money, which makes it in their best interest to keep inflating their currency. For these reasons, the printing of more money and the purchasing of government debt must continue. This parabolic rise in dollar printing will eventually lead to a hyperinflationary scenario. The U.S. monetary base that had taken almost a full century to create (i.e. from 1918 to 2008) was more than doubled in just one year after the 2008 crisis, and with more monetary easing along the way, the path to higher levels of inflation and eventual hyperinflation has been established. The Fed will not be able to service hiked interest rates as it did in 1980 to stave off hyperinflation once the velocity of this relatively dormant monetary base increases, as the U.S. debt load is much greater than it was in 1980. Raising interest rates would entail increasing the debt to unmanageable highs, so this is no longer an option for the Fed. A giant global credit bubble occurred after the American government took the dollar off the gold standard in 1971 and started printing money at a phenomenal rate. The fiscal irresponsibility of living off the future by creating free credit and passing debt down to later generations is presently causing many other bubbles and crises to occur in a variety of markets. Now that the Federal Reserve and other central banks across the world are limited to printing their currencies in a parabolic manner in order to avoid insolvency, financial institutions and investors across the world are seeking to hedge their money in commodities, and more particularly, precious metals. Indeed, a distinct move from paper assets to real assets can now be observed, and only those who do not take heed of this trend will lose out by being on the wrong side of the greatest wealth transfer to occur in the history of humankind. 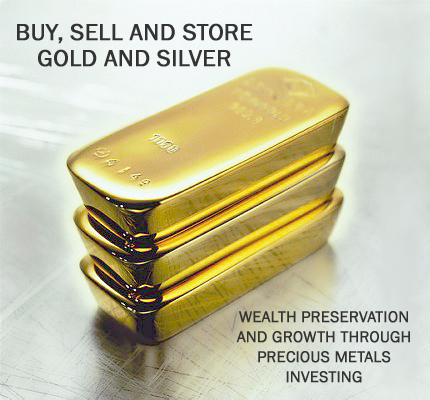 Indeed, gold and silver are presently acting as distress signals and arbiters in their righting decades of fiscal and monetary irresponsibility by governments and central banks.